Power management plays an essential role in designs for industrial and automation applications. Regulating power is also crucial in robotics and emerging technologies such as drones. When stepping down voltages from input to output supplies in these applications — while stepping up current — buck regulators come into play. These days, it’s becoming more and more important for designers to handle energy resources consciously. As a result, the efficiency of power management components is increasingly important for manufacturers of such modules. Vishay, a supplier of an unmatched collection of semiconductor and passive components, has taken up the cause, putting great effort into developing highly efficient buck regulators for use in general purpose point-of-load (POL) applications in industrial power supplies, automation, and consumer electronics. 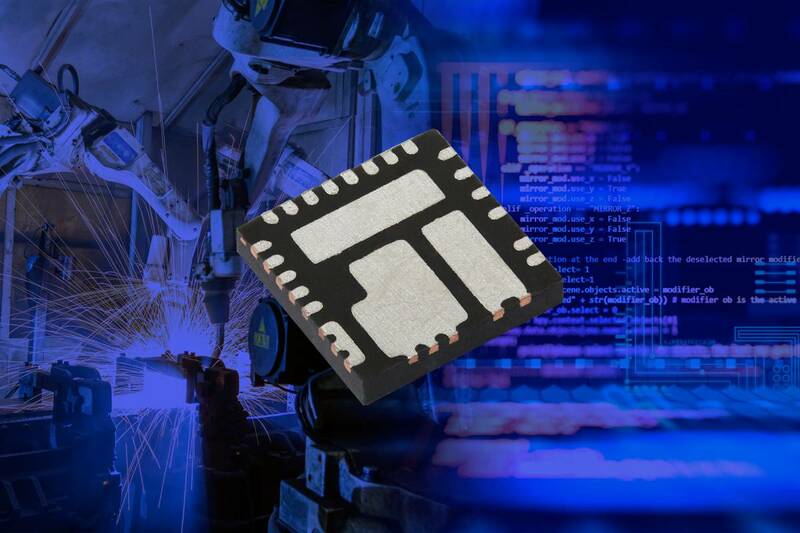 With its microBUCK® integrated circuits (ICs), Vishay offers a scalable family of compact devices that are highly efficient at both light and full loads. Within the Vishay microBUCK family, the SiC46x series of DC/DC regulators offers a wide input range from 4.5 V to 60 V and output power to 75 W. This makes them perfect for a wide range of applications, including industrial automation systems, base station power supplies, wall transformer regulation, home automation, battery management systems, power tools, and vending, ATM, and slot machines. The devices can step down voltages from a high voltage bus to an intermediate bus, while their constant on-time architecture allows direct conversion down to low voltages, eliminating the intermediate bus altogether to simplify power designs. Packaging a controller and MOSFETs in one package, the synchronous buck regulators achieve peak efficiency of 97 %. As buck regulators are often used in rough conditions, they must be capable of handling high temperatures. Vishay microBUCK ICs are therefore equipped with various protection features. In addition to undervoltage protection (UVP) and overvoltage protection (OVP), overtemperature (OTP) protection shuts down the power supply if its temperature reaches a threshold level. 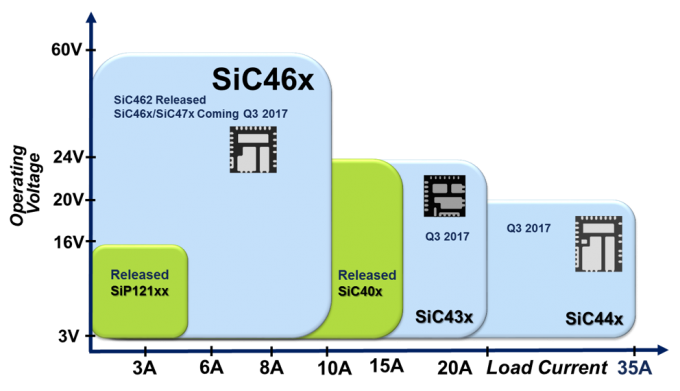 SiC46x series also offers an advantage over the competition when it comes to component size. The devices save board space with their design simplicity and by eliminating the need for external components. If you are looking for a power IC solution, you can learn more about Vishay’s portfolio here. And we’d love to support you in your design. Please contact us here if we can be of assistance. EBV and Vishay have enjoyed a successful collaboration since 1973. 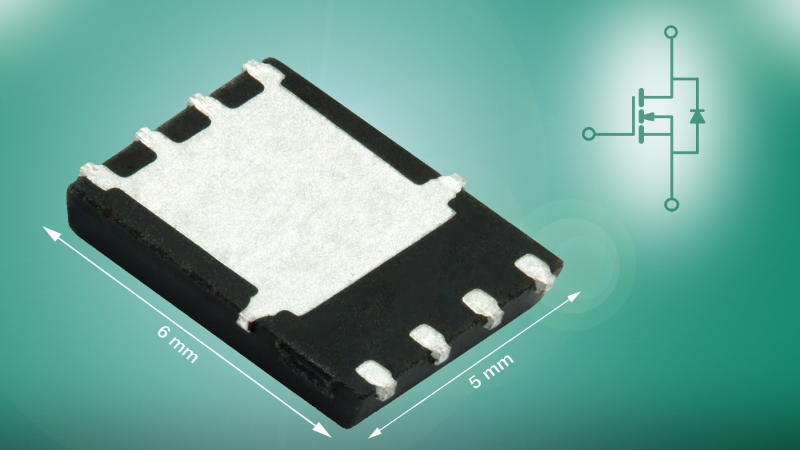 With its enhanced wafer fabrication in Germany, Vishay has recently released exciting and competitive MOSFET and power IC technologies, as well as a complete range of opto sensors for the industrial and automotive markets. Stay tuned for more developments in these categories.